Home › BSAP › The Journey Starts Now! There are striking commonalities among this year’s crop of Baxter Student Ambassadors; they are adventure seekers, backpackers, digital nomads, eager to explore Canada, and in search of authentic experiences around the globe. They also share a strong belief that travel has the power to change lives and shift perspectives. “I believe a lot of hate comes from ignorance and the more you travel, the less ignorant you can claim to be,” explains Whitney Turner, a Global Travel and Tourism graduate from Sheridan College. With that kind of hopeful optimism, it’s no wonder these students were selected as the future stars of our Canadian travel industry. Based on a combination of academic success, community involvement, and leadership skills, BSAP identifies the most promising student talent in travel, tourism and hospitality programs at Canada’s leading colleges and universities. Through a skill-testing webinar presentation, one student from each of this year’s 14 participating institutions is selected as the Baxter Student Ambassador to represent their school. Winning students will get a kick-start to their careers through a variety of networking and learning opportunities, plus the chance to gain hands-on experience through an internship or travel prize. 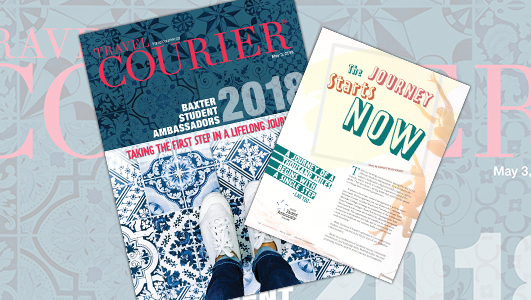 To meet the 2018 Baxter Student Ambassadors, check out this week’s special issue of Travel Courier.